The Great Zimbabwe Ruins are set in the rugged south eastern hills near Lake Mutirikwe and the historical town of Masvingo, close to the Chimanimani Mountains and the Chipinge District. Great Zimbabwe takes its name from the Shona word for stone houses, as the old capital of the Kingdom of Zimbabwe during the countries late iron age. The city acted as the royal palace for the Zimbabwean monarchs. Hence many of its prominent features have a distinctly regal feel to them. With three distinct architectural groups evident within the ruins, being the Hill Complex, Valley Complex and The Great Enclosure this abandoned city is now considered a national monument. The most notable of the artefacts are the eight Zimbabwean birds that have been carved from soapstone, situated on top of monoliths, the size of a full grown human. Archaeological evidence suggests that Great Zimbabwe was once a thriving centre of trade, with its unique artistic achievements evident to all that visit, this ruined ancient yet once great city has struck the imagination of many African and European travellers alike. If African history is what you crave, the Great Zimbabwe monuments is the perfect pit stop. Its splendour and mystery take you back to a time and place when Africa was at its greatest. A variety of explorative excursions to the ruins are offered on a daily basis, the guides are passionate and well informed making for an extremely educational experience. On the tour you shall learn about the origins and history as well as the eventual decline of this once majestic city, whilst walking along the various trading routes. As your guide continues to impart his knowledge of the city and its inhabitants social and religious practises you begin to feel as if you have been transported back in time. The historical monument is the main attraction for visitors to the town of Masvingo, which is only 30 kilometres southeast. Great Zimbabwe is an ideal detour for those craving a little cultural injection into their safari experience. Nearby at the Lake Mutirikwi Recreational Park game drives and walks can be embarked upon as well as sunset cruises and drives to the local neighbouring towns. The monuments can be visited any time of the year, where temperatures are generally hot and dry except for the summer rains. Due to the need for exploration it is better to visit during the slightly cooler winter months so the weather doesn’t get in one’s way. 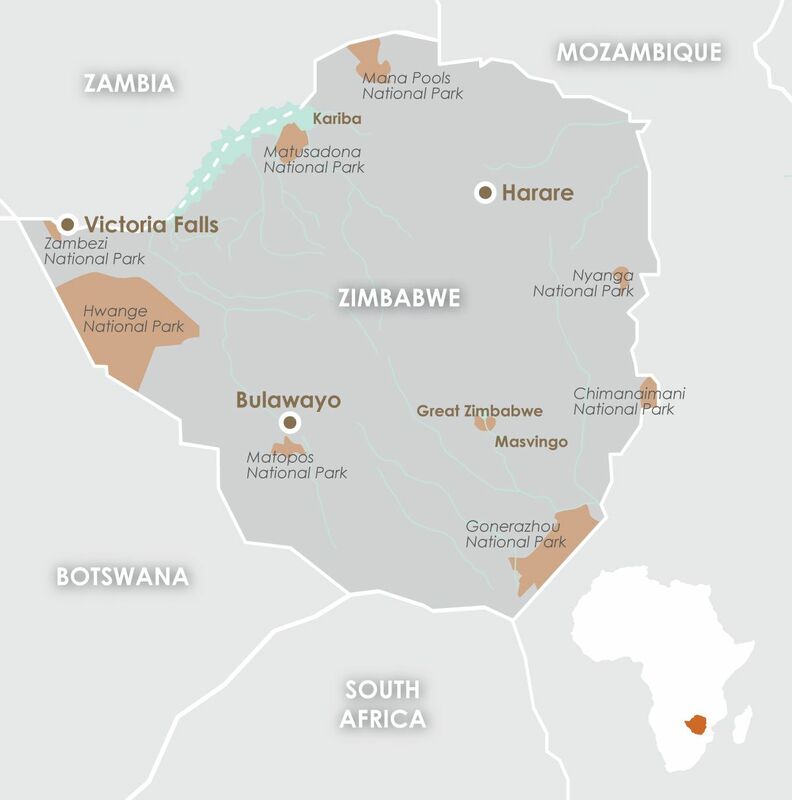 Great Zimbabwe and Masvingo boasts an 18-hole golf course and a freight railway line making them both easily accessible for all potential visitors. The surrounding areas provide visitors with the opportunity to experience a wide array of animals with twelve species of mammals on offer including the ever-elusive white rhino.